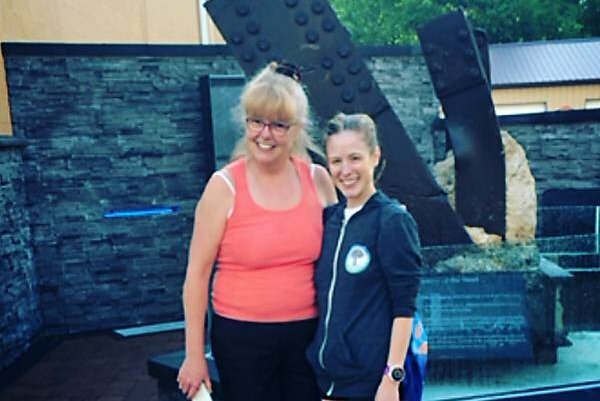 The author and her mother stopped by the 9-11 memorial in Audubon, Camden County, while stalking Pokemon during a walk. We all need different levels of motivation to exercise. My father achieved American Ninja power-walking status after purchasing his first Fitbit two years ago. Since then, he’s traveled more than 5,000 miles. My brother, who’s a Marine, needs little more than a Monster energy drink and an old pair of Asics to go for a jog. He’s no frills – no GPS watch, no MP3 player. I’m somewhere in the middle. Spotify Premium and my Garmin 220 keep me pumped to run 50 miles a week. My mother, on the other hand, loves to garden, and while harvesting your own organic produce is associated with a host of health benefits, it doesn’t always require the continuous stream of cardiovascular activity that walking and running do. Since gardening is a warm weather activity, she suffers a void in the fall and winter. And, since neither of her children inherited her green thumb, my mother gardens alone. In addition to my daily 7-mile runs, I regularly take long walks to clear my head, boost my mood and break free from my sedentary writing regime. I like to observe people, and nature, and store window displays. It’s a habit I picked up as an adult, one I wish I had developed sooner, because it keeps me from going stir-crazy. I’ve been bugging my mother to join me on my walks for years, but she’s usually too stir-crazy herself to imagine walking might help. Still, every so often, I’d ask and she’d say no – until she got hooked on Pokémon Go. And then, a few days ago, out of the blue, she asked me if I’d like to go for a walk. Let’s be clear: I don’t play Pokémon. I didn’t play the original game 20 years ago and I don’t play the virtual version now. My initial reaction to the Pokémon Go phenomenon was to turn my nose up at the legions of gamers wandering the streets with their heads down, eyes glued to their smartphones. I’ve griped with numerous running friends about near collisions we’ve had with “Poképeople” while out on our training runs. But I jumped at the chance to take a stroll with my mother around my childhood neighborhood, while she collected Poké Balls, or hatched eggs, or whatever. We first set out on a sunny afternoon. Every so often, an animated character would appear on her iPhone screen and she’d chase after it like an Easter egg, while I took stylized photos of Queen Anne’s lace for my Instagram. She captured digital “Pidgeys” and I caught tangible cottonwood seeds. Oscillating between physical and virtual realities, we talked about our real world problems and our abstract dreams. And it was really nice. We stopped by the new 911 memorial in Audubon, Camden County. The raw, artistic tribute consists of a 7,000-pound mass of twisted steel and concrete rubble retrieved from the former North Tower. An underrated feature of Pokémon Go is its potential to exercise not just the body, but also the mind and the spirit. Historical landmarks, monuments, and museums are hotspots for Pokémon. They’re places I wouldn’t have visited with my mother, if the virtual creatures hadn’t lured us there. You could say people who need to chase fictitious video game characters for physical activity and family bonding are hopeless or pathetic. But I think it’s senseless to be a pessimistic Luddite, when you can be an optimistic tech apologist. There’s virtue in light-hearted entertainment that brings people together when it seems like our world is falling apart. It’s not just about escapism. It’s about opening yourself up to surprises and finding silver linings. It’s about accumulating steps you otherwise wouldn’t have taken. How long will Pokémon Go be popular? When its appeal fades, will my mother’s new walking routine persist? She says there’s no way she’ll continue playing through the dead of winter, when it’s too cold to go outside and hunt for Pokémon. But it’s only July, and they say it takes just 30 days to form a new habit. I’m hoping she and all the other Pokémon Go devotees are hooked on walking for the sake of walking (and talking) by the time winter rolls around. And, well, if it’s too cold to walk then, it won’t be too cold to run.